CAOHC, the Council for Accreditation in Occupational Hearing Conservation, was created to fill the need for guidelines and standards in the occupational hearing conservation field. Its main objective is to provide to those serving industry the education, information and guidance to implement successful occupational hearing loss prevention programs. Our courses strictly follow the guidelines and requirements of CAOHC for certification and recertification. Those who successfully complete the CAOHC approved course will become certified occupational hearing conservationists (OHC). The OHC is educated in the practice of hearing conservation and is trained for administration of pure-tone air-conduction hearing tests and other associated hearing conservation duties. The OHC can provide services at Occupational Health Clinics and in occupational settings. Our course is also very well suited for those responsible for administration of employer hearing conservation programs. Participants gain knowledge in all areas of HCPs as well as the very latest information in practical applications, technology and advances in the field. It is an excellent opportunity for Industrial Hygienists and Certified Safety Professionals to gain relevant, practical knowledge while obtaining continuing education credits. Certification of testers is required for compliance with WISHA, OR-OSHA, and MSHA. It is also a very important factor in determination of validity of hearing tests in workers’ compensation cases. To become CAOHC certified as an OHC, one must successfully complete a CAOHC approved 20–hour certification course (valid for 5 years and renewable through an 8–hour recertification course). Classes may be conducted at your own location as requested. 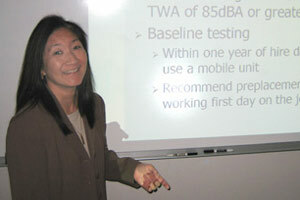 Courses are also offered through through Washington Audiology Services in Seattle.